ON THE COVER — Mountains Course home at bighorn Golf Club. Photography by John Waggaman. Michelle Wie, pro golf’s youngest star, takes up residence in Palm Desert. 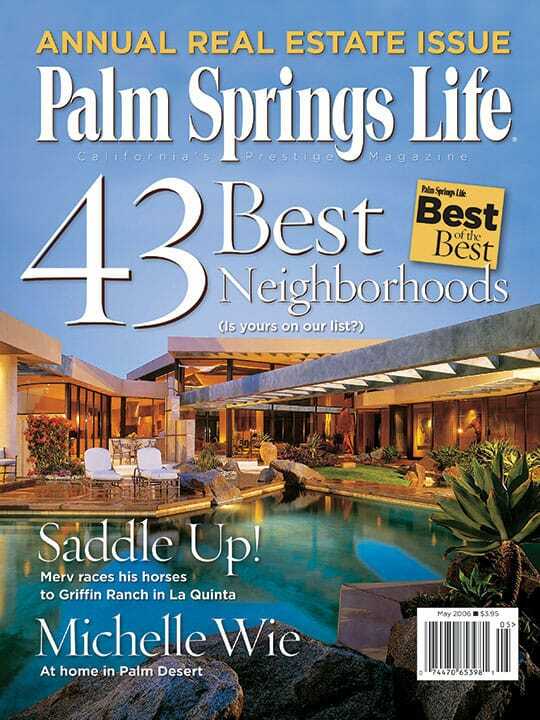 Palm Springs Life assessed communities throughout the Coachella Valley, measured them for their qualitative and quantitative attributes, and identified 43 of the best — including the perfect one for you! Story by Roxanne Jones. Photography by Denise George. At 80, Merv Griffin still plays a role in entertainment, but his first love — thoroughbred horses — inspired his new residential community in La Quinta. Griffin Ranch, the desert’s first upscale equestrian community, includes The Saddle Club’s two arenas, dressage areas, and air-conditioned boarding for 78 horses. As the real estate market comes to a level point, home buyers and sellers revise their game plans. Paul Gregory’s Night of the Hunter has been grabbing attention the last 50 years – 10 years after it was made.